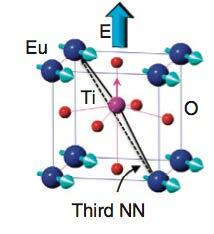 The response of the Ti atom to E-field is represented pictorially as a displacement along the direction of the field distorting the Eu–Ti–Eu third NN bond alignment. Intrinsic magnetoelectric coupling describes the microscopic interaction between magnetic and electric polarization in a single-phase material. The control of the magnetic state of a material with an electric field is an enticing prospect for device engineering. MRSEC researchers are collaborators have demonstrated giant magnetoelectric cross-field control in a europium titanate film. In bulk form, EuTiO3, is antiferromagnetic, but anti- and ferromagnetic interactions coexist between different europium neighbors. In thin epitaxial films, strain alters the relative strength of the two interactions. Moderate biaxial compression precipitates local magnetic competition, and the application of an electric field switches the magnetic ground state from antiferromagnetic to ferromagnetic. Using firstprinciples density functional theory, we resolve the underlying microscopic mechanism for G-type magnetic order and illustrate how it is responsible for the giant magnetoelectric effect, with great promise for future devices that control magnetic states with electric fields.